Theo Decker, a 'god of layers' perhaps, and that is what he is, surviving a bomb blast that kills his mother, comforting a dying antique trader and following his delirious urging to take hold of a treasure that takes hold of him in so many layered ways. There are times this book infuriates when characters fail to do what 99 per cent of people would do - what you the reader are urging them to do - and so end up in several long chapters of chaos. And then there are the thousands of sweeping words that carry you forward, heart racing. Or the long ragings at the world or detailed vivisections of meaning that cut so close to the doubts of your own heart. 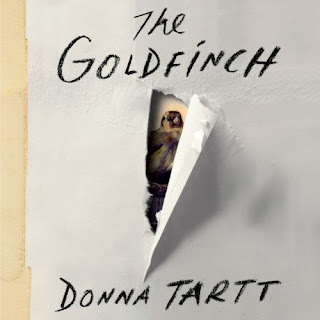 As a title, The Goldfinch suggests a stuffy but polite story of manners and it is a story of manners but never stuffy or polite and not what you would think at all. It tells of the world we all might nearly belong to if our deceptions were allowed to fester a little longer. A world just beyond ours, that world we wonder about when we hear of bomb blasts or art heists or overdoses or murders. A world we are all a part of but just not looking. At the end there is Tolstoyian reflection, a moment of clarity and perception, but sadly not quite a coming of faith. That would be too simple, too hopeful. But that is a world that also exists, one we might nearly belong to if our faith was allowed to flourish a little longer, and we chose to look. If that had been the case, Theo may have found his namesake, and the author would have had a different tail, not just Paradise Lose but Paradise Regained. While you are sorting this out for yourself, you could do worse than to be ground down relentlessly by Donna Tartt's Pulitzer winning prose. So, read The Goldfinch.